Prepare two 8x8 inch glass baking pans and one 9x13 inch baking pan by spraying lightly with non-stick baking spray and wiping with a paper towel, leaving only a slight film of the oil. This will help the gelatin release easily from the pans later. Prepare the two packages of green Jell-O according to package directions (with 2 cups boiling water, 2 cups cold water). 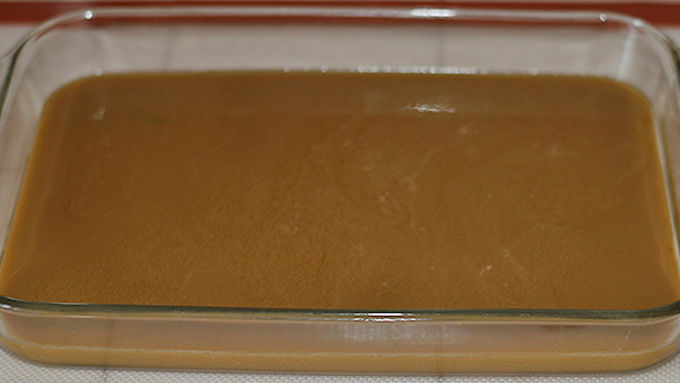 Divide gelatin liquid into two dishes, leaving one as it is. To the other, whisk in 2 tablespoons sweetened condensed milk to make the liquid opaque. To that one, also add a tiny bit of black gel food color on a toothpick to color the mixture Army green. Start with just a bit, adding more if needed to get desired coloration. 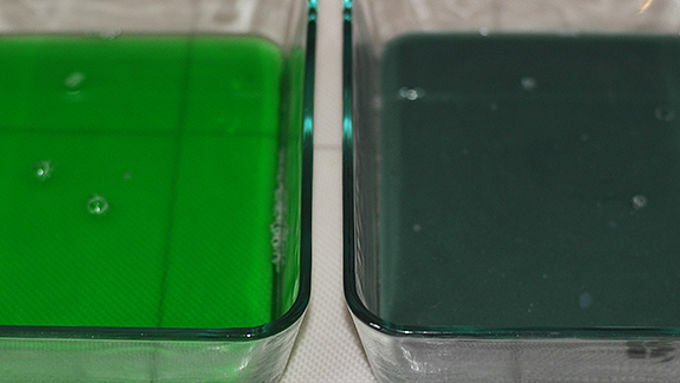 Pour the transparent green Jell-O into one 8x8 inch pan, and the opaque Army green mixture into the other 8x8 inch pan. Refrigerate pans uncovered for 90 minutes or until soft-set. Remove from fridge and, using a spoon or fork, scramble the gelatin to a scrambled-eggs consistency. Return pans to fridge for an additional 30 minutes. Meanwhile, add 2 cups of boiling water to the envelope of unflavored gelatin plus the 2 packages of yellow Jell-O. Whisk until powders are thoroughly dissolved. Add 2 cups of chilled vodka and 4 tablespoons of sweetened condensed milk to make the mixture opaque. Using a toothpick, add just a dab of black icing food color to the mixture and whisk, adding some red and yellow liquid food coloring, until a dark camo tan color is achieved. Pour into the 9x13 inch prepared pan and allow mixture to cool COMPLETELY on the counter before continuing with next step (or the colors will melt and blend). 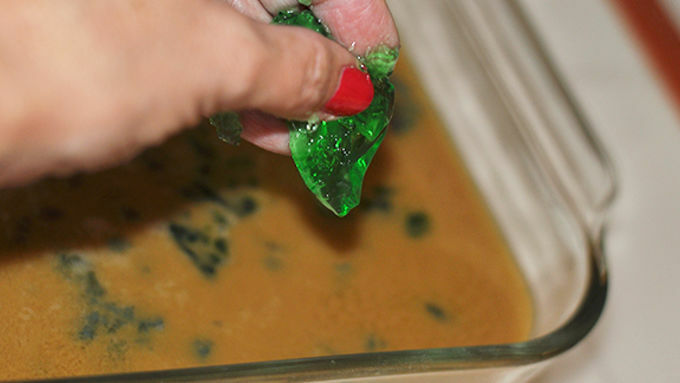 When tan mixture is cooled to room temperature on the counter, remove the two scrambled green Jell-O pans from fridge and, using your fingers, sprinkle the greens randomly over the cooled tan base mixture in a mottled pattern. Mix the greens, adding some of one, then some of the other, repeating back and forth between the colors until both are added to the tan. Do not stir or mix further. Place 9x13 inch pan in fridge for 3 hours. When ready to serve, cut into 40 squares and remove with a small spatula to tray or small appetizer plates. Garnish as desired with whipped cream, sprinkles, or candies. To make these into kid-friendly gelatin squares for a camo party, omit the vodka and substitute cold water. Anyone who digs camouflage will get a kick out of these jelly shots made with camouflage colors and vodka. Camo partiers, wake up to the call of the wild – in jelly shot form! You can make these Camo Jelly Shots perty dern easy. It only takes some time to gel (duh), but the time is totally worth it. Cut into small squares. Add whipped cream and sandy-colored (gold) edible glitter over the top just before serving. And, HI-HO, you've got CAMO! 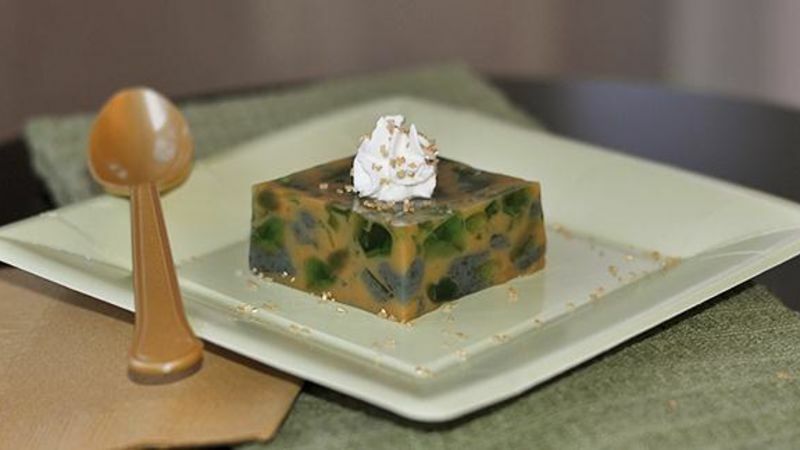 To make these into kid-friendly gelatin squares for a camo party, substitute cold water for the vodka.